Boiled, fried, steamed, or soupy, dumplings hit the sport as a snack, an appetizer, or even as an entrée all on their own. In a city as diverse as New York is in its cultural and culinary landscape, there are, happily, plenty of great spots to dig in on dumplings, with many of them located in or around Chinatown. With so many options to choose from, however, you'd be wise to seek out one that's reputable and delicious. Since eight is considered the luckiest number in Chinese culture, here's a list of eight great places to dine on delicious dumplings right here in Manhattan. A must if you're in Chinatown, Lan Zhou Handmade Noodle is a go-to spot for your next dumpling fix. The dumplings' sauce, flavor, and overall consistency are why people keep coming back again and again. Give their noodles a go, as well—they are the restaurant's namesake, after all. One of the best places for steamed soup dumplings (xiao long bao) in New York City, Shanghai Cafe Deluxe has rightly earned a strong following. Their dumplings come with great flavor, with a delicious broth/filling and a textured, thick doughy skin. There are plenty of other Chinese dishes worth checking out on their extensive menu, as well. Fuzhou Wei Zhong Wei is a buried treasure (quite literally), since the restaurant is located in the basement of a mall beneath the Manhattan Bridge. This may be the last place you'd expect to find quality grub especially considering how inexpensive the food is, yet Fuzhou Wei Zhong Wei delivers with the Chinese fair, particularly their dumplings, which tout the perfect balance of flavor between the dough and fillings. 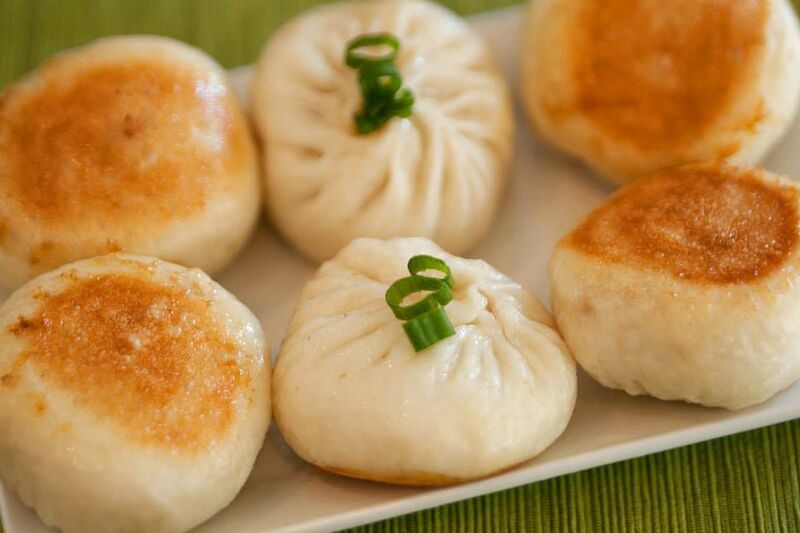 For good cheap eats, Vanessa's Dumpling House is a solid bet. A serving or two of their delicious dumplings should hit the spot just fine. If you're still hungry, the sesame pancake sandwiches are also worth a bite. In addition to the original Chinatown location that opened in 1999, there's another Vanessa's in Manhattan located near Union Square. If you're looking for affordable dumplings that taste great, Tasty Dumpling is definitely worth a visit. The name's no lie, and you can get affordable Beijing-style dumplings here for as little as five for $1. (Note that prices vary a little depending on the type of dumpling.) If you'd like to purchase some dumplings to prepare at home, Tasty Dumpling also sells frozen dumplings in batches of 50. Another good spot for delicious and inexpensive dumplings, Shu Jiao Fu Zhou Cuisine Restaurant delivers the goods for a reasonable price, to boot: 10 dumplings for just $3. In addition to dumplings, this small Chinatown spot is also worth checking out for their flavorful noodles in peanut butter sauce. Joe's Shanghai, with a longstanding reputation in New York City, is a solid choice if you're looking for steamed soup dumplings. They’re delicious indeed, with the perfect mix of broth and chewy dough. In addition to the popular (and often packed) Chinatown location, there's another Joe's Shanghai up in Midtown. Originally opened in Flushing, Queens, Xi'an Famous Foods has since expanded to multiple locations in Manhattan, including shops in Chinatown, the East Village, Midtown, the Upper East Side, and the Upper West Side. Keep an eye out for their spicy and sour lamb dumplings (note: they're not available at their 45th Street location in Midtown). These fancy dumplings are pricey compared to the others on this list (6 dumplings for $7), but the taste is worth it.